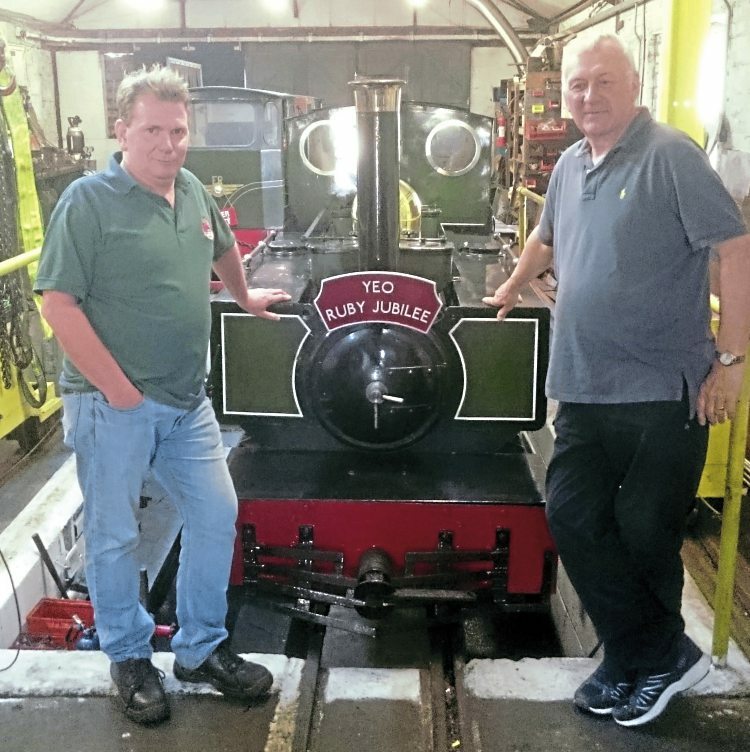 FAIRBOURNE Railway locomotive Yeo is celebrating its 40th birthday this year. Built in 1978 as works number 1078 by David Curwen and a half-scale replica of a Lynton & Barnstaple Manning Wardle 2-6-2T, it first ran in France on the short-lived Réseau Guerlédan line in Brittany. FR publicity officer Graham Billington handed over a commemorative headboard to general manager Murray Dods in July. The wording Yeo Ruby Jubilee is a reference also to Yeo’s original name, Jubilee, which the locomotive again carried during the 2012 season to celebrate the Queen’s Diamond Jubilee. Meanwhile, in addition to paying its visit to the Littlehampton Miniature Railway as part of that line’s 50th anniversary celebrations, the opportunity was also taken for Sherpa, the FR’s 0-4-0ST+T, to call in at the other south coast 12¼in gauge line at Exbury Gardens. There it spent two days working in a variety of combinations with the home fleet, but could not work trains by itself due to a lack of air brakes. In a reciprocal move, the EGR’s 0-6-2T+T will visit the FR on July 28-29 for the annual gala, the first visiting 12¼in gauge steam locomotive for many years. It will be joined on the 15in gauge dual-gauge track by Evesham Vale Light Railway-based 0-4-0T+T Saint Egwin and former FR 0-6-0 diesel Rachel.